The ZINI was founded in Milan, Italy, in 1956. Since then, combining modern technologies with the traditional craftsmanship of the family, became one of the largest Italian industries mass. In Brazil, the company began its activities in 1992, and its product line is based on fresh pasta such as gnocchi, lasagna sheets, polenta, pasta and also flour for empanamento, wheat fibers without bitterness, sauces and new ecological oven. The ZINI features a modern Analysis Laboratory, integrated factory, which results in better quality control of products and production processes, which have always characterized its operations. It also has a very model quality management, similar to the main certification rules, which follows rigorously preparing for the HACCP and in the future, the ISO certificate. Pioneering, innovation of products and manufacturing processes, are the guidelines that keeps ZINI always ahead. Following the global trends of environmental protection, the company developed ecosustentáveis ​​products that do not require refrigeration and can ensure a considerable reduction in the use of water for their preparation, compared with dried pasta. also provide gas savings of resources and manpower, simplifying handling and control. The company also produces a line of flour to empanamento Fioccopan, the only market with lipófoba feature, ideal for empanamentos with minimal absorption of oil and other specific applications. Besides the quality of its products, resulting in the total satisfaction of its customers, the company develops technological solutions to containment in the price level, which make them very competitive ZINI products in the consumer channel, food service and services to third parties. And to demonstrate the quality and practicality of its products, ZINI developed a model restaurant called PIAZZA ZINI. It is a special corner, much more than a canteen, whose dishes and environments provide the opportunity to experience a rare experience. 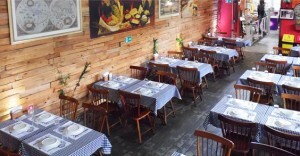 It is an interactive dining space, created to please all the senses, decorated in warm and unique way, both the ambiance reminiscent of old Italian GIs like to have in their old vehicles facilities, recycled objects and mass production equipment of the last century , seeming to refer clients back in time. In the cafeteria you can taste delicious ice cream, including the whole containing pure fibers, the amazing “affogato al caffé” or just enjoy a traditional espresso, to close markedly a tasty and enjoyable meal. The Emporium Zini makes available the entire line of ZINI products, wholesale and retail, as well as a range of other excellent products such as wines, olive oils, sauces, juices, biscuits, etc. Develop and market concepts and food products (pasta and ingredients) practical, healthy and economical, with solutions and differentiated processing. To be recognized (reputable) as an innovator, manufacturer and supplier of pasta and ingredients which do not require refrigeration, through unique technology, proposing and supporting new concepts of food benefit. Ethics: constructive relationships with suppliers, customers and employees, based on partnership and trust bonds, with respect and moral values. Sustainability: commitment to reduce energy waste and consumption by providing food products with a high degree of sustainability, practical and healthy. Social Responsibility: strict responsible marketing practices, reiterating the commitment to the health and quality of food to consumers. Transparency: this quality policy at all levels, with its own model of GMP, HACCP seeking certifications (System Analysis and Critical Control Point) and ISO.